The Sweepmaster B800 R works according to the overhead throwing principle which ensures the hopper is filled to the full. This promotes uninterrupted work and a constant, first class sweeping performance. To ensure the machine continues to provide consistent cleaning results, the filter in the insert can be shaken clean occasionally. To clean it after completing work, it can be accessed from the clean side easily and quickly. 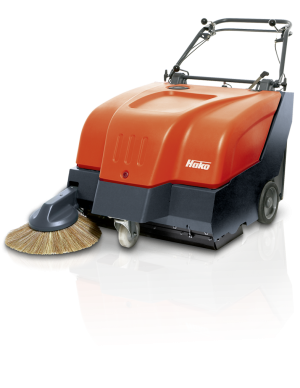 The robust, steel frame construction in heavy-duty quality means the Hako-Sweepmaster is a machine for professional use which can clean surfaces thoroughly and efficiently for a number of years! They are suitable for recreation and shopping centres, large warehouses, modern production facilities and car parks. Very efficient and convenient in use. Operation – operates fully hydraulically. Powerful Dust Filter System – no-tools quick-change filter for easy routine maintenance. Dual dust filters as standard. Engine swing – 360 degree engine and hydraulic accessibility for ease of maintenance, less down time and more productivity. High Dump – the heavy-duty steel hopper can be lifted from ground level up to 1.62 m for variable dumping. High Capacity Hopper – the large 600-litre debris hopper guarantees long operating times for best possible economic efficiency. Power Climb – the machine is capable of climbing high kerbs and managing up to 16% inclines while sweeping and with fully loaded hopper. 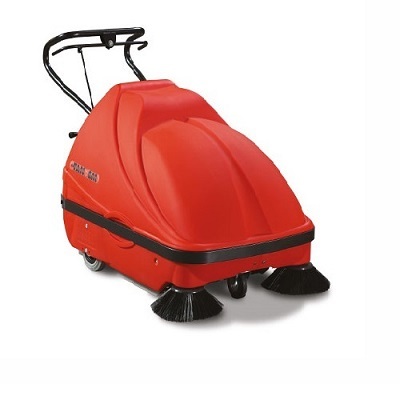 The sweepmaster 980 R vacuum sweeper can be tailored to meet any need e.g. comfort seat, warning light, LPG drive, raised dumping, left-hand side brush, vacuum cleaner for electric vehicles, cab safety roof and much more. Machine can be assembled to fulfill individual needs. The large innovative cylindrical brush together with powerful suction turbine achieves perfect sweeping results. Hako resonance shaking system enables long periods between cleaning and a filtration efficiency of over 99%. Perfect Sweeping Results – Maximally two side brooms can be fitted enabling thorough sweeping close to borders. A powerful suction turbine, equipped with a panel air filter with a filtration efficiency of over 90%. The Optimum Drive Solution for Every Purpose – the sweepmaster 980 R powered by liquefied petroleum gas (LPG) option provide a particularly clean and efficient drive. Operating time of up to 4.5 hours without interruption are possible. Convenient in Use Dirt Hoppers – two dirt hoppers can be removed and emptied easily. High Dump – the dirt hoppers can be raised and emptied at a touch of button. Maneuverability – minimal turning circle for confined spaces. Stolzenberg Tandem KSV 1000 is a professional Petrol Engine Operated Vacuum Sweeper. Unmatched hand-operated sweeper performance, this machine is an indispensable working tool for all areas in which maximum performance is required: Industry, Services, municipal use, etc. The extremely powerful dust extraction of this vacuum sweeper with a volume capacity of over 600 cubic meters of air flow per hour through the 3 m² dust filter, combined with the technically sophisticated tandem roller system makes the Tandem KSE 1000 a sweeper for the optimal removal of fine and coarse dirt in the professional sector – quickly, thoroughly and easily. The mechanical filter developed by Stolzenberg even cleans deep rib areas reliably and eliminates up to 45% more dust from the filter ribs than conventional cleaning mechanisms. 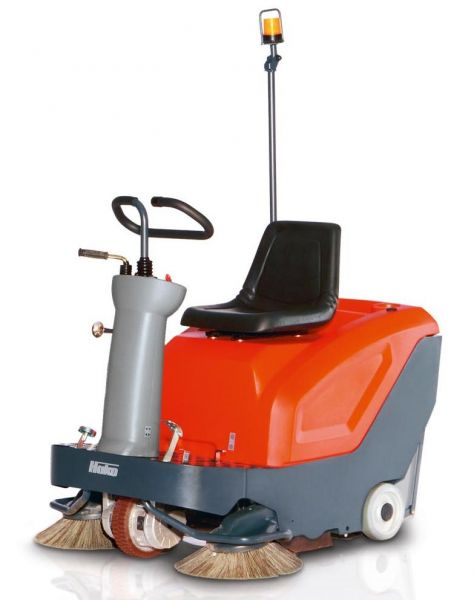 M600 is manually operated sweeper having unequalled high sweeping and collecting capacity for up to 2,300 m2/hour. Suitability – Suitable for small areas being fitted with an indestructible plastic dirt hopper, an impact-resistant steel frame and solid aluminium housing. Maneuverability – particularly handy, maneuverable and extremely easy to operate. A practical solution for trade, commercial and industrial sites as well as demanding property owners. Clean operation – the side brush sweeps the dirt thoroughly from the corners and borders directly into the path of the wide cylindrical brush. The dirt hoppers are very easy to remove and empty. Handlebar/Grip – the handlebar position can be adjusted optimally for every user, thanks to its ergonomic design and can be changed around. Overcoming obstacles – kerbs and stairs can be negotiated without any problem, thanks to the large wheels which project at the rear. Fits through any door. 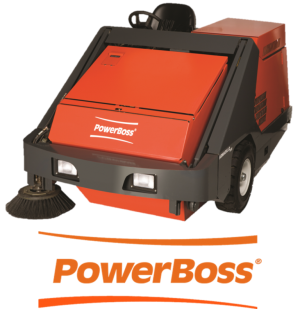 When dealing with the dust-free cleaning of small and medium-sized areas, the sweepmaster B800 is simply the best option. It provides long periods of uninterrupted work and a constant, first class sweeping result. 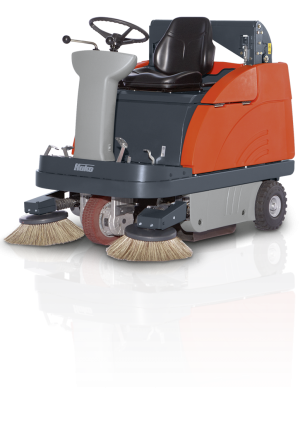 Reliability – the robust, steel frame construction in heavy-duty quality makes the sweepmaster a really professional device which can clean surfaces efficiently for a number of years. Comfortable Hopper System – the swiveling handlebar simplifies opening the hopper, its easy removal and throwing in large debris. B800 has two dirt hoppers attached, which means better distributed weight and easier to empty hoppers. Maintenance-free Battery Drive – can be charged at any power socket with onboard charger. Close to Edge Cleaning – large overlapping of side brush ensures close to edge cleaning. 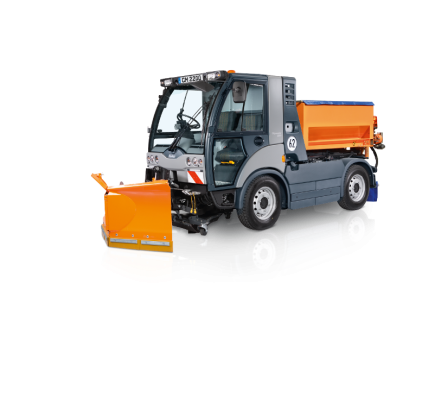 The Citymaster 600 is a multifunctional compact sweeper with the ability to offer both winter maintenance and grounds maintenance attachments. Front coupling triangle for all attachments with low noise hydraulic drive. Universal hopper for increased flexibility. Articulated steering for improved manoeuvrability. If you are looking for an efficient, professional sweeper to carry out all your tasks reliably, Citymaster 1600 is the perfect option. It meets your demands perfectly with maximum operating and driving comfort. Whether used exclusively as a compact sweeper or as a versatile implement carrier, this machine embodies Hako’s many years experience in manufacturing sweepers, compact tractors and implement carriers as well as transporters. AGR Quality Seal – The Citymaster 1600 is the only machine bearing the AGR quality seal. The workplace offers superior ergonomics to prevent back problems – which has been independently tested and recommended by the AGR e.V. (German Association for Healthy Backs). Flexibility – the citymaster 1600 is both the sweeper with articulated steering and a multifunctional implement carrier, all in one. Comfort – the full-suspension chassis and the spacious cabin go easy on both the driver and the vehicle. The driver has everything under control thanks to the integrated operating panel – and everything in view thanks to the central display and the panoramic view. Suction System and Dirt Hopper – the tangential suction system with energy-saving fav ensures that the sweeping systems take up dirt reliably while protecting the joints in paving. The efficient separation system ensures optimal filling of the dirt hopper. Sweeping System – 2 or 3 broom systems area available and interchangeable. 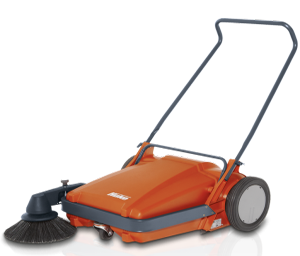 The two broom system is ideal for use in confined areas and offers the opportunity to sweep corners in reverse mode. The three broom system comprises a variety controlled pre-sweep broom and the basic brroms for transporting dirt to the suction duct. 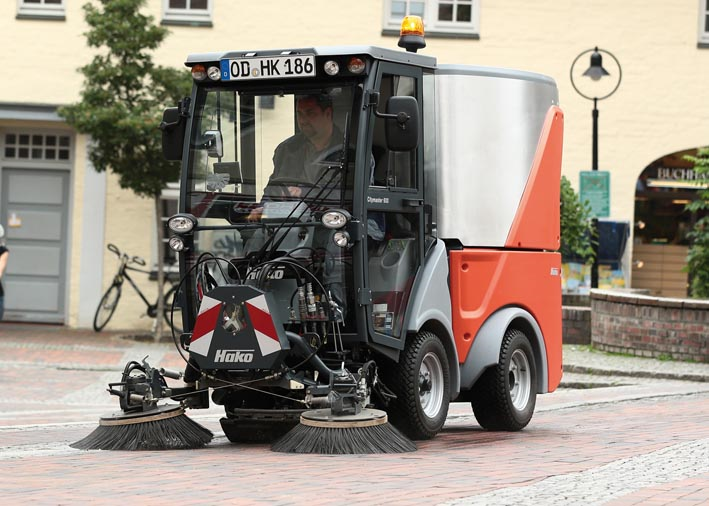 The Citymaster 2200 is developed to provide maximum economic efficiency, safety and flexibility when it comes to cleaning public areas. Large high-quality components meet the highest standards in modern municipal technology in terms of quality and durability. Equipped with either two or three broom system and with dirt hopper capacity that is second to none in this class of machines, the vehicle ensures extremely time-efficient sweeping. 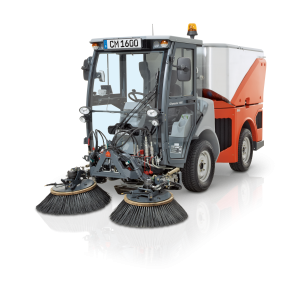 Three in one, Sweeping, Wet Cleaning, Winter Service – in addition to its fuction as professional sweeper, Citymaster 2200 is extremely flexible in use. The quick change system enables easy demounting of the sweeping technology and machine can be used for wet cleaning or winter service tasks. Ecolabel “Blue Angel” – the eco lablel RAL-UZ 59 “Blue Angel” considers both the permissible noise level and exhaust emissions of a machine to protect the people’s health and the environment . AGR Quality Seal – The Citymaster 2200 is the only machine in this class bearing the AGR quality seal. The workplace offers superior ergonomics to prevent back problems – which has been independently tested and recommended by the AGR e.V. (German Association for Healthy Backs). Only products that have passed a strict test procedure receive the AGR seal of approval. Safety Standards of the Highest Level – safety starts with the vehicle concept. Same high standards have been followed, which includes a safety concept for the driver cabin, as well as disc brakes and ABS integrated into hydrostatic drive. Daytime running light as standard, large reflectors, bright LED flashing beacon, everything has been done for the driver’s safety.